Somerset Patriots outfielder Scott Cousins signs an autograph at the 2015 Atlantic League All-Star Game. 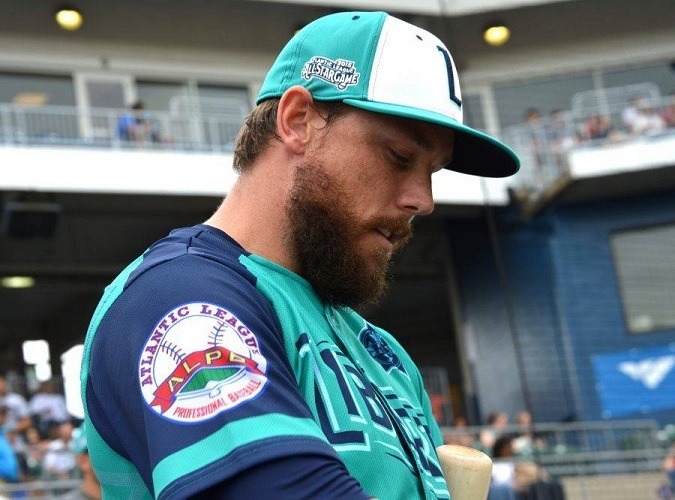 All-Star Games virtually always have a feel-good atmosphere to them, and Wednesday's Atlantic League contest in Bridgeport fit right in for two very special reasons. Former major league outfielder Scott Cousins used the occasion as the finale of his playing career, and when Liberty Division (and host Bluefish) Manager Ricky VanAsselberg sent him out to centerfield to start the fifth inning then promptly replaced the 30-year-old he was treated to a lengthy ovation from the crowd of 4,660 plus hugs and handshakes from his All-Star teammates. Cousins, one of nine former major league players in the All-Star Game, will forever be remembered as the player who crashed into San Francisco Giants catcher Buster Posey while scoring on a sacrifice fly May 25, 2011, a controversial play that kept the major league All-Star out of action for the remainder of the season. But it should not be forgotten that the left-handed Nevada native was good enough to play in 135 major league games and accomplished the rare feat of hitting back-to-back pinch hit triples for Miami. He hit .264 in 43 games with a homer, 18 RBI and 12 steals this season in helping Somerset win the first half title in the Liberty Division. It was Cousins's first inning walk that led to the first run of the All-Star Game although he was forced at second base when shortstop Lance Zawadzki of Lancaster fielded a grounder and magically flipped it behind his back to second for the out. The other joyful event in the evening, which included in a 5-1 Freedom Division victory, came from longtime league Executive Director Joe Klein, who said three player contracts were sold during the All-Star break, giving the league an all-time high of 33 sales to major league organizations and foreign leagues by this time in a season. One of the sales saw two-time 19-game winner Chien Ming Wang going to Seattle's Triple-A club in Tacoma after only three starts for the other first half champion, Southern Maryland. Ten scouts for major league teams were on hand to study the 44 players, who included Sugar Land infielder Patrick Palmeiro, the son of former major league star Rafael Palmeiro. Two current or former York pitchers are in the news, with lefty Ian Thomas once again leaving Triple-A Oklahoma City to join the parent Los Angeles Dodgers and right-hander Shawn Hill leaving the Revolution for a time to pitch for Team Canada in the Pan-Am Games starting this weekend. While Thomas's numbers have not been outstanding, he is 3-1 in Triple-A and 0-1 in the major leagues this season. It has been a struggle for Hill, posting a 1-7 record and 4.38 earned run average for York. Previously the chief spokesman for Commissioners Bowie Kuhn and Peter Ueberroth, Bob Wirz has been writing extensively about the Atlantic League and Independent Baseball since 2003. He will be a frequent contributor to this site as well as writing his blog,www.IndyBaseballChatter.com.